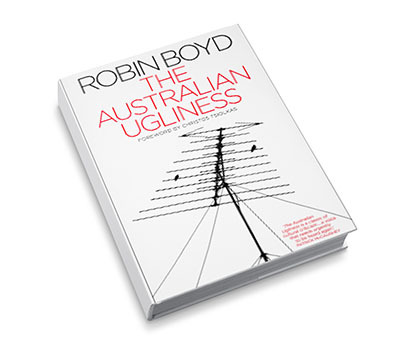 The Robin Boyd Foundation has recently collaborated with Text Publishing to publish a new edition of Robin Boyd”s acclaimed book The Australian Ugliness. This 50th anniversary edition contains a new foreword by Christos Tsiolkas as well as a new afterword written by John Denton, Phillip Goad and Geoffrey London. This new edition is now generally available in paperback format in bookshops. The Robin Boyd Foundation has also commissioned a very special hard cover limited edition version of The Australian Ugliness. This limited edition is restricted to 300 individually numbered copies of which only 150 copies are available for sale.